As an American band inspired by equally by Cambodian pop music as well as American 60’s bands (you can hear the Credence dripping out of each song), DENGUE FEVER, occupies a fascinating niche. While most of the band hails from LA, their songs didn’t even have any English until their third record. Formed by brothers Ethan and Zac Holtzman in 2001, they met up with Cambodian immigrant (and already a famous karaoke singer in her native country), Chhom Nimol, to fill out the sound of the band. Their latest full length is called Cannibal Courtship is their fifth and they’re touring to support it. We took some time to talk to DENGUE FEVER’s Ethan Holtzman about their upcoming Madison show. Maximum Ink: What inspired you guys to pick up instruments and play in the first place? Ethan Holtzman: My dad plays a little bit of guitar and taught Zac (my brother who is also in Dengue Fever) and I folk songs at an early age. We learned the basic 1, 4,5 chords for old songs like “Good Night Irene” by Leadbelly and all the classic Woody Guthrie standards. We sang most nights around our only heating source, which was a potbelly stove. MI: What was the thing that struck you the most about Cambodian pop? EH: The vocals stood out. The voices of Cambodia (late 1960’s) reminded me of a cobra snake bobbing in and out of a basket. Up and down the vocals weaved there way through the song. The native tongue and the high range of notes sounded like an instrument of its own. The garage rock instrumentation, Farfisa organ, reverb soaked surf guitar, drums and bass sounded so lo-fi and cool I just listened to the songs over and over until the cassette tape wore thin and broke. I actually tied a knot with the tape, where it broke, and it worked. MI: What would you recommend as the song to listen to for people who are listening to you for the first time? EH: That is a tough question because we have a lot of songs that range in tempo and style. I guess if I had to pick one it would be “1000 Tears of a Tarantula”. It’s my mom’s favorite song of ours so there you go. It was a jam that started in the studio. We then decided to write the lyrics about one of the stories of a famous Khmer singer who was forced to sing under the hot sun, naked, until she dropped dead. This was Khmer Rouge torture. The singer was born in Battambang, Cambodia. Our singer Chhom Nimol was also born there. MI: Do you see a difference between American and Asian crowds? Is there a unique cultural response to your music? EH: It’s nice to see the Cambodian fans get really passionate about our shows. Americans too, but the connection some Cambodians have to our music and their culture forms a strong bond. The Khmer fans like to take lots of photos after the shows. Also, on our first trip to Cambodia I noticed that we brought the two cultures together into the same nightclub. In Phnom Penh, there are clubs for locals and clubs for ex-pats. It felt really good to break down the separation and all just enjoy the music together. It was a rare occurrence for Dengue Fever to play in Cambodia and the buzz created while we were there had the strength of a hundred beehives. MI: What inspired the title Cannibal Courtship? EH: It’s about taking small bites of the other culture while being inextricably tied together. The cover of our album showcases the visual symbolism of such an act, Dengue Fever’s very own “Mastadong”. The instrument is a blending of two countries 8,200 miles apart—a double neck guitar conceived by a Fender Jazz Master and Cambodian Chapei. MI: What song do you think best represents Dengue Fever from that album? What inspired it? EH: The song entitled: “Durian Dowry.” It’s about the love of a poor man who wishes he could offer more for the woman that he loves. Perhaps it will be a love consummated in the next life. The durian is a uniquely pungent and thorny fruit from SE Asia that symbolizes romantic love and has been used as an aphrodisiac by men. MI: As a band that integrates cultures and music, what do you think the biggest challenge is to get your message across? EH: Cultural Authenticity. It’s an age-old dilemma that many artists feel when confronting their work. How do you find the connection between two geographically distanced and divergent cultural climates while trying to stay true to yourself? To address this complex issue while creating art, our band is constantly shifting perspectives and cultural ideas to find the broader thread of human interconnectedness. 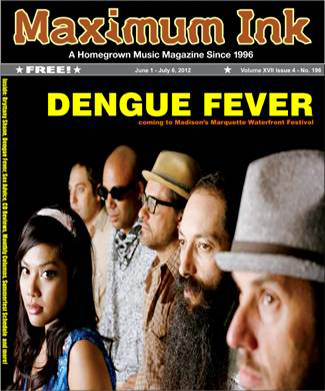 DENGUE FEVER plays June 9th at Marquette Waterfront Festival in Madison.